There are 40 speaking parts. See at the end of the script how to have fewer parts. You can choose which birds are played by girls and which by boys. It should be fun to imitate the bird calls. It should be fun to design and make the bird costumes. It should also be fun to create the back drops for the different settings. Often the birds can act as stage hands to move these into place. Mother Earth THERE IS A BACKDROP OF A MOSSY GLADE IN A FOREST WITH BEHIND, AT NIGHT, A CIRCLE OF SNOWY MOUNTAINS AND A FULL MOON. SCENE MAKERS: USE THESE PICTURES TO INSPIRE YOU. THE NARRATORS ARE TO THE SIDE OF THE STAGE. MOTHER EARTH IS STANDING CENTRE STAGE LOOKING VERY SAD. A SMALL BOY AND GIRL ARE LOOKING UP AT HER. MOTHER EARTH: Mother Earth was very sad. She was bowed down with grief. Mother Earth, are you all right? What can we do? Listen and you will learn. She was sending a message to her birds all over the world. The birds could understand she was calling them. And telling them where to meet. (CALLING OUT) I need your help. 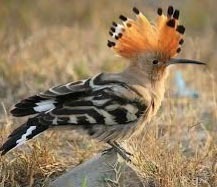 THE HOOPOE APPEARS IN A BEAUTIFUL BIRD COSTUME WAVING ITS ARMS AS WINGS. Please will you gather together in one place ; so I can speak to you? THE HOOPOE MAKES ITS CALL AND SIGNALS TO OTHER BIRDS TO COME. THEY APPEAR, FLYING (WAVING THEIR ARMS/WINGS) AT THE SIDE OF THE STAGE. 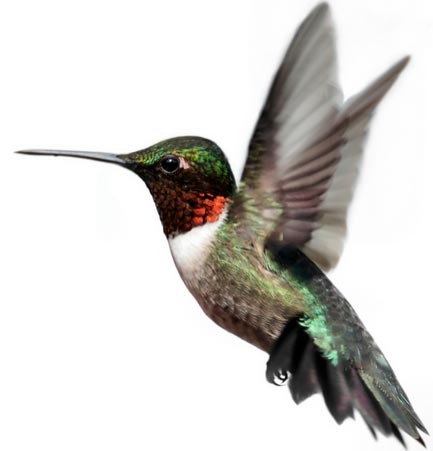 HUMMING BIRD: They flew secretly at night. 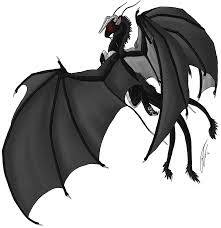 So that only the boy and girl and night creatures would hear the whisper of their wings. As they flew they called to each other. What does the Earth want? What can the Earth need? Why does she want to speak to us? At last the birds reached the place the Earth had named. 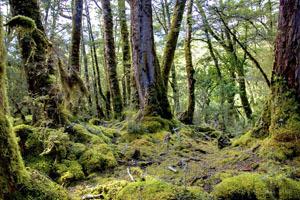 It was a mossy glade in the middle of a forest. 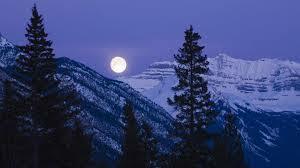 High above the trees a circle of snowy mountains glistened in the light of the full moon. MANY BIRDS ARRIVE. THEY WHISTLE AND TWEET AND MAKE THEIR BIRD CALLS. THEY LOOK AT EACH OTHER IN AMAZEMENT. AS THEY ARE DESCRIBED, THEY MOVE FORWARD AND BOW OR CURTSEY AND MAKE THEIR BIRD CALLS TO THE AUDIENCE. 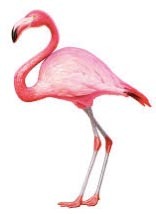 They were the great crested crane and the pink flamingo from Africa. THE GREAT CRESTED CRANE MOVES FORWARD BOWS AND MAKES HIS NOISE. HE THEN MAKES WAY FOR THE FLAMINGO AND SHE MOVES FORWARD MAKES HER NOISE AND CURTSIES. The tiny fragile humming bird and the golden crested wren. THEY MOVE FORWARD, BOW OR CURTSEY AND MAKE THEIR BIRD CALLS. 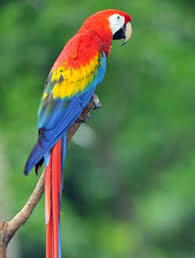 The bright parrot from South America. The tree sparrow from China. 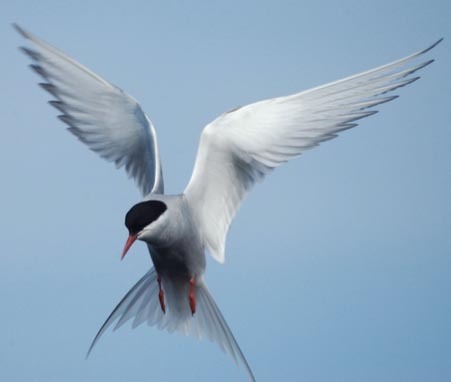 NARRATOR 1: The Arctic Tern had flown many miles from the Far North. 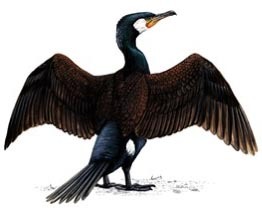 HE OR SHE COMES FORWARD AND MAKES A BOW OR CURTSEY AND MAKES THE CORMORANT BIRD CALL. The Cormorant from the sea shores and the Albatross from the far oceans. THEY BOW OR CURTSIE AND MAKE CORMORANT AND ALBATROSS CALLS. 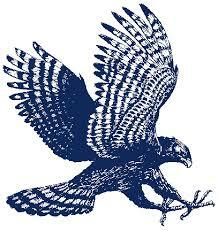 The Falcon, the Eagle and the great, gliding Condor had come from the high mountains and from wild, desolate places. AGAIN THEY BOW OR CURTSIE AND MAKE THEIR CALLS. There were birds with strange faces like the owl. HE MAKES HIS "TOO-WIT TOO-WOO" SOUND. 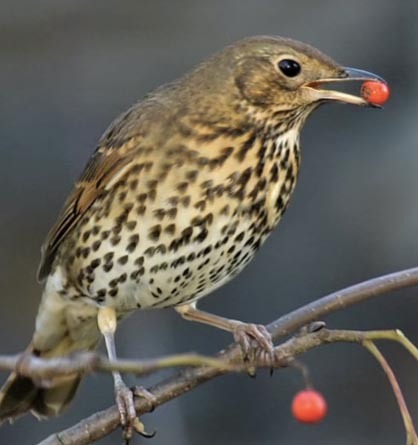 And birds that sang beautifully like the Nightingale and the Thrush. THEY CURTSIE AND MAKE THEIR SONGS. 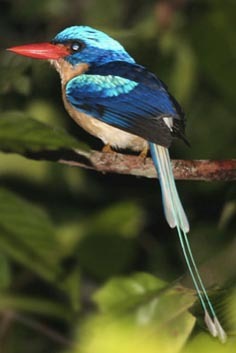 Magical birds like the Paradise Kingfisher and the Fairy Bluebird. THEY TOO BOW OR CURTSIE AND MAKE THEIR SONGS. 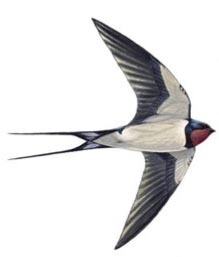 And birds everyone knows like the swallows. 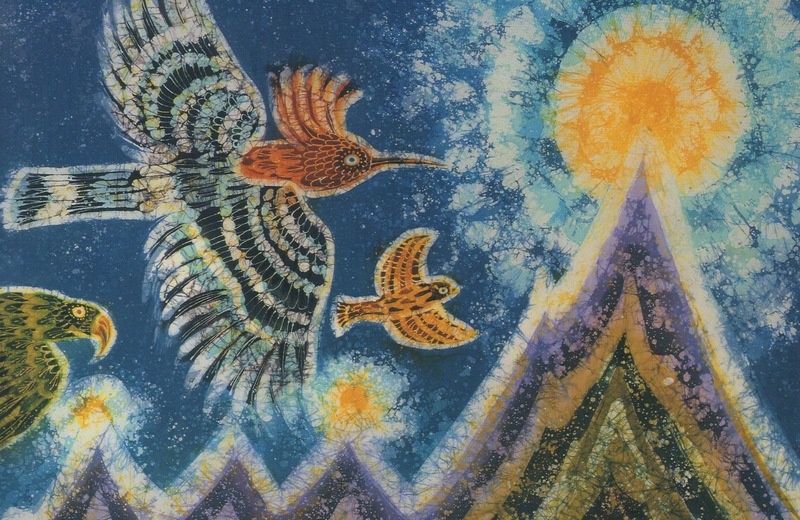 MOTHER EARTH: There were hundreds and thousands of birds from everywhere on Earth. They settled down to listen to what the Earth had to say. MOTHER EARTH, THE BOY AND THE GIRL MOVE FORWARD. THE BIRDS MOVE BACK NERVOUSLY. You are my birds. Be not afraid of me. You have been part of my life for millions of years. I have given you food and shelter. You fly everywhere between Earth and Sky and you see everything. You know more than people or animals because you are free to explore every hidden place. So you know that my seas and rivers are filled with poisonous wastes, which hurt and kill my fish. My forests are being cut down, so we can no longer breathe properly. My sky is torn and the sun's burning rays injure me. Poisons are buried deep in my body. They make us feel ill.
That's right. And we cannot grow food for all the life we love. Yes. What will happen to all the children? The world will wither and die. MOTHER EARTH: That's not all. In many places our people are killing each other. Because they believe that I, the Earth, belongs to them alone. They make weapons from my body to destroy each other. They tear my body apart with their bombs. Millions of children are hungry. That's right. And you are taught to hate and fear each other. Few can hear my voice, the voice of the Earth. Only a few listen to my cry for help. SHE LOOKS UP AT THE BIRDS AGAIN. You, birds have seen all these things. THEY TURN TO THE EARTH. Are you brave enough to go on a special journey to save my life? (MAKES HIS CALL. UNCERTAIN) Well .......? Are you clever enough to find the place that lies east of the sun and west of the moon, over the edge of time, beyond the seven valleys? The place that is neither here nor there, but everywhere?? Are you strong enough to break the spell of the monsters of the seven valleys? Will you dive to the depth of the sea and look for the garden, where there is a house with a hidden treasure? I've never dived that far. In that house there is a Great Being. One who is never old nor ever young. Who is the life of all life. Say the Earth is in danger and has sent you for help. Then bring me back the message you are given. THE BIRDS TURN THEIR BACK ON MOTHER EARTH AND LOOK AT EACH OTHER. Come children. It is time for the birds to decide. NARRATOR 2 The birds were bewildered. They had never heard the voice of Mother Earth before. I've never heard of the Great Being..
And what are the seven valleys? And what does "beyond time" mean? And how can we reach a garden in the depths of the sea? Perhaps it's all in a dream. It's silly to fly so far to find something that might not be there. I don't think I have the strength for such a journey. We might die on the way. THE HOOPOE TAKES UP A POSITION TO FACE THEM ALL. The Hoopoe flew into the centre of the glade and addressed them all. DOVE: Dear Birds, I am a messenger of the world invisible. I know the way to the garden beyond the edge of time. I have entered the house of the Treasure and seen the Great Being. I can guide you to the place that is east of the sun and west of the moon. I have flown the lonely and dangerous way through the seven valleys to the hidden treasure hidden in the depth of the sea. I have seen through the hundred thousand veils of light and darkness that lie between us and the Great Being. 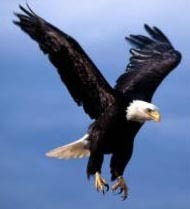 To make this journey you will need the courage of the eagle. (MAKING HIS CALL) Thank you. The night vision of the owl. (MAKING HER CALL) Thank you. I will see. The wisdom of the raven. (MAKING HIS CALL) Thank you. Am I really that wise? Yes. And the gentleness of the dove. (MAKES HER CALL). Thank you. 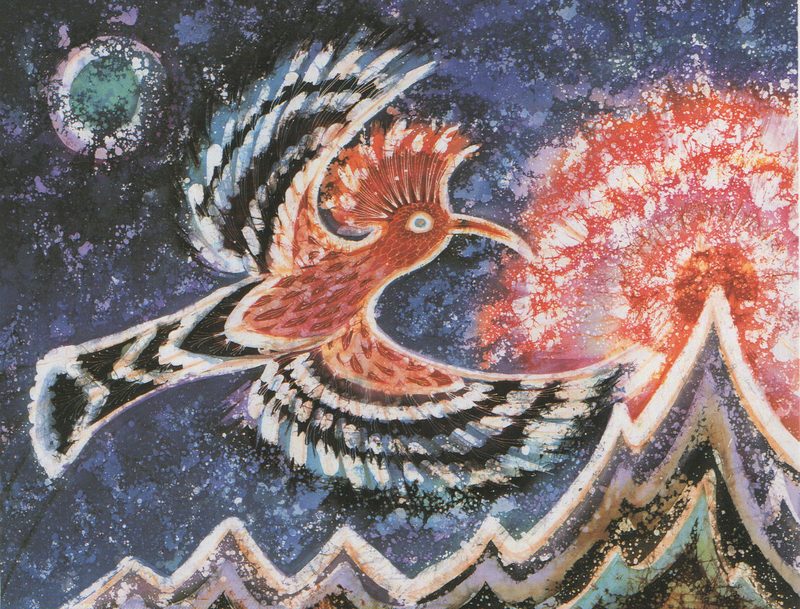 HOOPOE: Long ago, in the first days, the Great Being dropped a Golden Feather on the Earth. 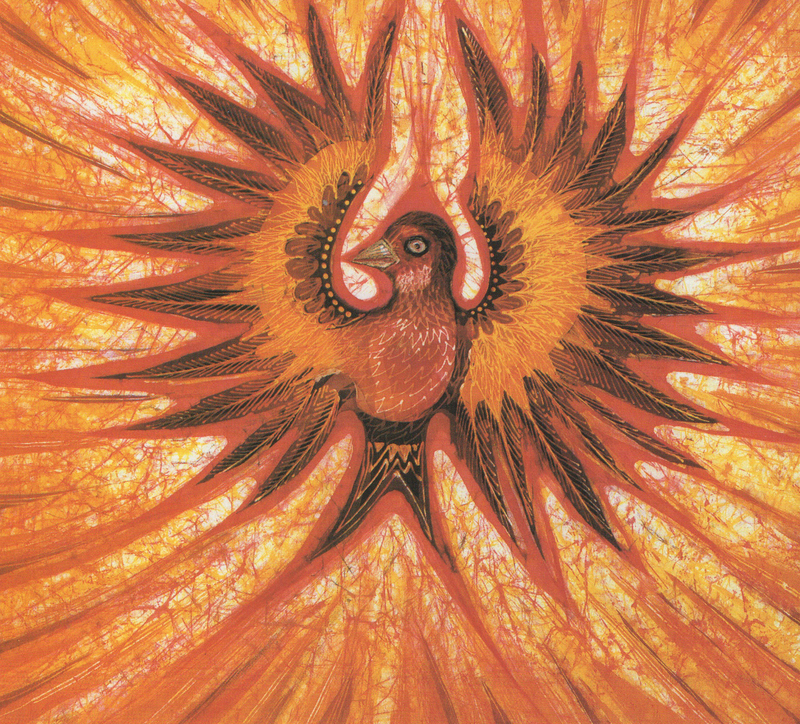 Every bird carried within its heart the same, magical Golden Feather; so that each was linked to all the others as well as to the Great Being. THE PEACOCK MAKES A GREAT FAN OF HIS FEATHERS. (SQUAWKS) My feathers are the best. That's on the outside. Many of you have forgotten the real feather inside your hearts, which links you together and to the Great Being. That's why you fight battles with each other and forget that you are all children of Mother Earth and that without Mother Earth you will die. HOOPOE: THE BIRDS EXCEPT THE HOOPOE MOVE TO THE BACK OF THE STAGE AND MIME TALKING TO EACH OTHER. At first they decided they would all go together. But then they began to think how long and difficult the journey might be. They began to make excuses. THE NIGHTINGALE COMES FORWARD. SHE SINGS A LITTLE. I love to sing all night to the rose in the gardens of the earth. If I go on this journey the rose might wither and die without my song. What good will your singing be if there are no gardens left and no roses to fill them? Open your throat and sing to the birds as they face the dangers of the journey. Sing to them of trust and hope and courage and joy so they don't lose heart. THE PARROT MOVES FORWARD, MAKING HIS PARROT SQUAWK. If I leave the warm, moist jungle, how would I survive in another place? What's the point of my making this journey, when I may not be able to live in that garden, let alone find my way back? Where will you live when your forests are cut down? Why do you have so little trust in yourself, and so little love for the Earth, who has cared for you like a mother for so long? 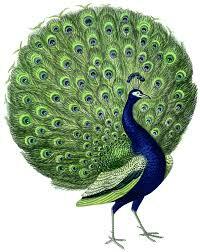 THE PEACOCK WITH HIS MAGNIFICENT FEATHERS COMES FORWARD MAKING HIS PEACOCK CALL. I think the Earth is exaggerating. I am an expert. I know better than the Earth what is going on in the seas and forests, the deserts and cities of the world. This Great Being she talks of may be just a dream. There is no proof that what she says is true. 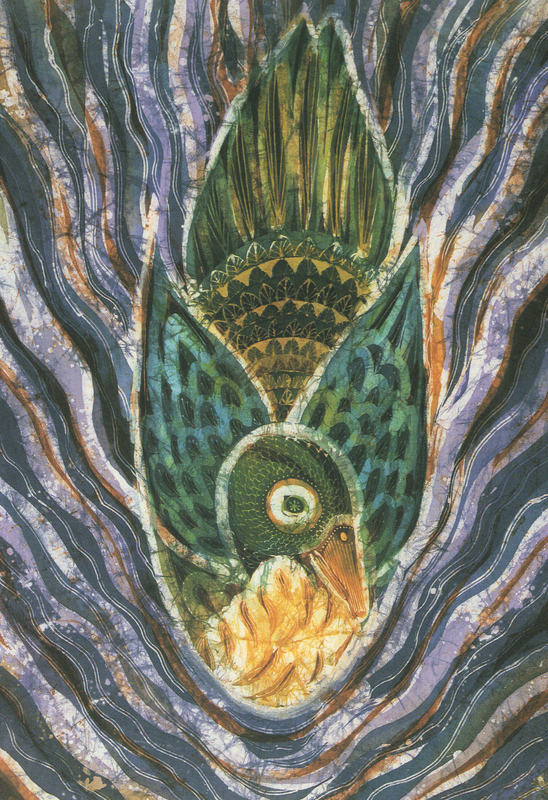 Foolish Peacock. Your splendour hides a cold heart. This is the first time Mother Earth has spoken to her birds. We do not need proof. We need to listen to her voice and trust to our hearts. THE DUCK COMES FORWARD, QUACKING. 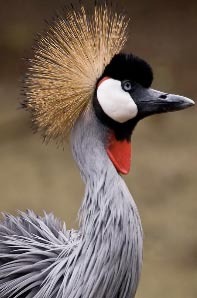 GREAT CRESTED CRANE: I live in ponds and rivers, where I find my food. But poisoned water from factories is pouring into them. Fish are dying and the water is no longer good for me. I will come with you for the sake of all the water birds and for the sake of the Earth. Thank you, Duck. Your courage will give strength to others. THE PARTRIDGE LIMPS FORWARD, MAKING HER CALL. I have been injured in the wars. My wife is dead; my children starving and homeless. My heart is burnt to ashes with hate for those who did these things. I can understand the pain the Earth is feeling. I will come with you to bring back a message from the Great Being to help her. Thank you, Partridge. This journey may heal your heart. THE HAWK SWOOPS AROUND THE STAGE AND ENDS UP BEFORE THE HOOPOE. HE MAKES HIS CALL. Suddenly the hawk, fierce and proud and dressed for battle swopped towards the hoopoe. I don't know why you weep and wail about war. There's always been war and there always will be. It's necessary to kill one's enemies and to suffer in order to win. Why should I face the dangers on the way when there are more glorious battles to fight here? You stain the Earth with blood. Why not be a warrior for peace? A warrior can protect life instead of destroying it. 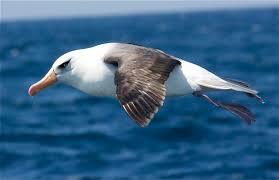 Is it not foolish to talk of war between birds, when the life of the planet is in danger? If you are as brave as you boast, come with us on our journey. Then the tall, grey heron stepped forth. 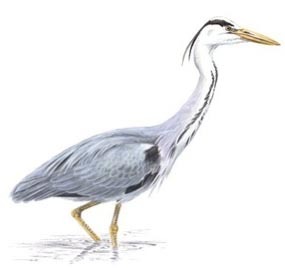 THE TALL GREY HERON STEPS FORWARD. I am so gentle that no one complains about me. I stand at the edge of the water, dreaming my dreams. I am too delicate for the journey you speak of. Dreams can take you away from your true path in life. Like lakes and rivers, dreams may be gentle and pleasant, but they may also drown you like raging flood waters. then your dreams may become true. THE HUMMING BIRD STEPS FORWARD. 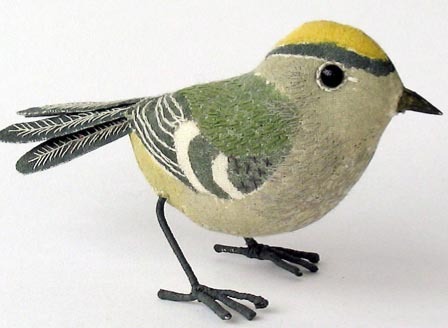 Do you think a tiny bird like me, weak as butterfly, could make her way to the garden of the Great Being? 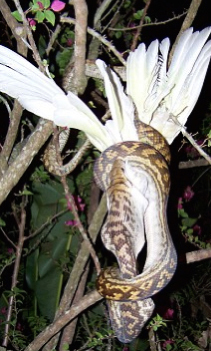 A humming bird could never do it. How do you know what you can do, unless you start out? Sometimes the weak have more courage and endurance than the strong. Take heart and join us. What a story you will have to tell your children. THE OWL COMES FORWARD, FLUFFING OUT HER FEATHERS. I was old before the Great Flood. I have witnessed many things, since the beginning of time. It is too late for us to do anything. There are too few of us who care. 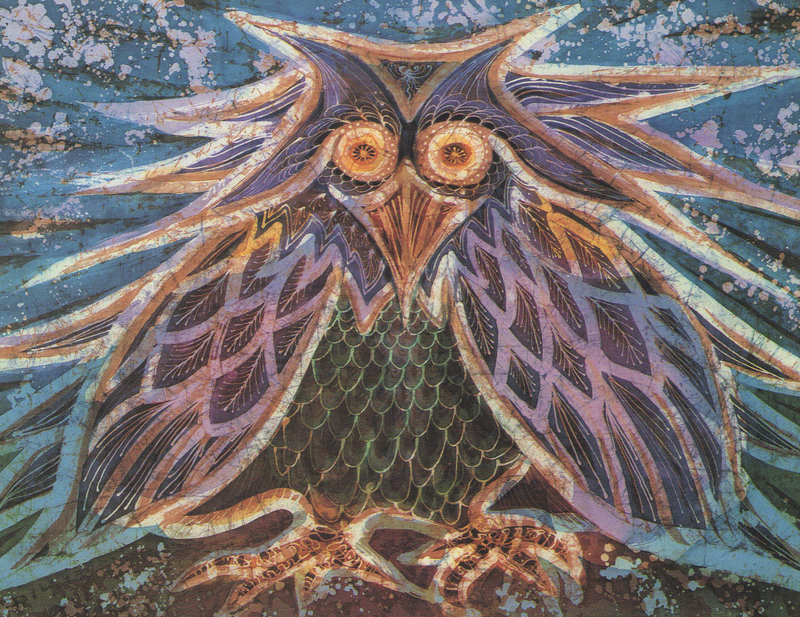 Wise owl, most respected of birds. It is never too late. Where danger is greatest, there is the greatest hope for change. 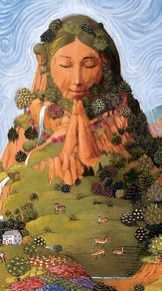 Mother Earth has chosen us to help her. As she trusts us, cannot we trust her? The choice you make can change the past and the future. THE BIRDS FORM A LARGE RING OR TWO AND PUT THEIR ARMS / WINGS ROUND EACH OTHER'S SHOULDERS OR WAISTS, NODDING THEIR HEADS AND MAKING THEIR CALLS. After the birds made their choice, the Hoopoe spoke once more. If you lose yourself in a glass of water, how will you dive to the depths of the sea, beyond the edge of time? If you cannot light a tiny flame, how will you reach the blazing fire at the heart of life? If you you don't have the energy of an atom, how will you find the strength to help the Earth? For this quest you must have the heart of a lion. It will be a miracle if we survive this journey. 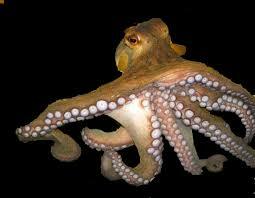 Could you tell us something of this Great Being? Who lives east of the sun and west of the moon? Then perhaps we would have the courage to set forth. NARRATOR 2: Oh birds without memory! You have forgotten the Golden Feather in your hearts, which floats like a song on the breath of the Great Being. If you love Mother Earth as much as she loves you, set out with fiery hearts towards the goal, making that your greater joy! Now the birds felt a change of heart. Their love of Morthe Earth lifted them up. The idea of the Great Being filled them with wonder. We have to fly into a great darkness, the darkness of the seven valleys. Each valley is ruled by an invisible monster, who lives inside a high mountain. Everything in each valley lies under a monster's magic spell. The Hoopoe explained how once, long ago, the monsters were one with the Great Being. But pain and fear came between them and separated them. She explained that because they were wounded, they wounded others. We shall make the journey together, but each must find his or her own path through the valleys. As you break the spell of the monster who rules each valley, you will discover skills you did not have before. You will become stronger and wiser and more loving. At last the trembling birds set out. WE SEE THEM FLAPPING THEIR WINGS AND HEAR THE SOUND OF MANY WINGS AS THE BIRDS LEAVE THE STAGE ON ONE SIDE AND THEN BEGIN TO APPEAR ON THE OTHER SIDE. FIRST COME A RAVEN, A DUCK, A PARTRIDGE, A FLAMINGO, A HAWK AND A GOLDEN CRESTED WREN. IF POSSIBLE THE STAGE GROWS DARKER. NARRATOR 2: Soon they saw before them the great darkness of the first valley, the valley of Doubt. The birds were terrified. 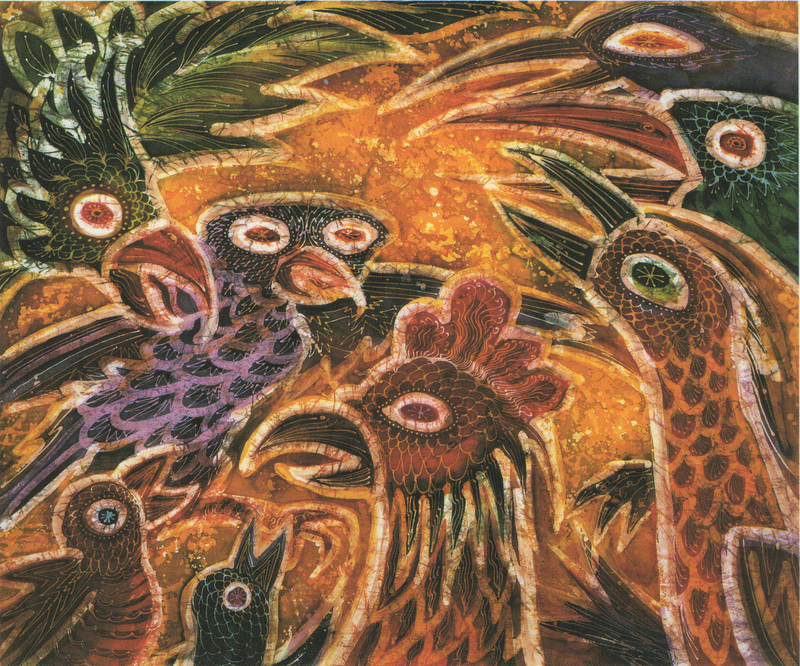 THE BIRDS HUDDLE TOGETHER, DRAWING IN THEIR HEADS AND WINGS. THEY MAKE SAD, FRIGHTENED BIRD CALLS. We can't go on this journey. Our wings and feathers are not strong enough to carry us through the darkness. (SHAKING) Look. I'm shaking with fear. We've never done anything like this before. If we fly into this valley, we'll never find our way through. THEY GET UP AND FLY BACK THE WAY THEY CAME. And away they flew, back to Earth. THE HOOPOE ARRIVES WITH ALL THE OTHER BIRDS. 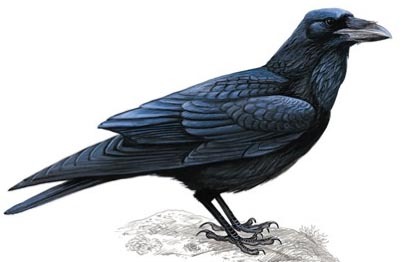 (THE RAVEN, DUCK, PARTRIDGE, FLAMINGO, HAWK AND GOLDEN CRESTED WREN WILL RE-APPEAR LATER BECAUSE IT IS ONLY ONE OF EACH OF THEIR SPECIES WHO HAS FLED). THE NIGHTINGALE AND THE TURTLE-DOVE SING. ACTORS JOIN IN WITH THE RECORDINGS. 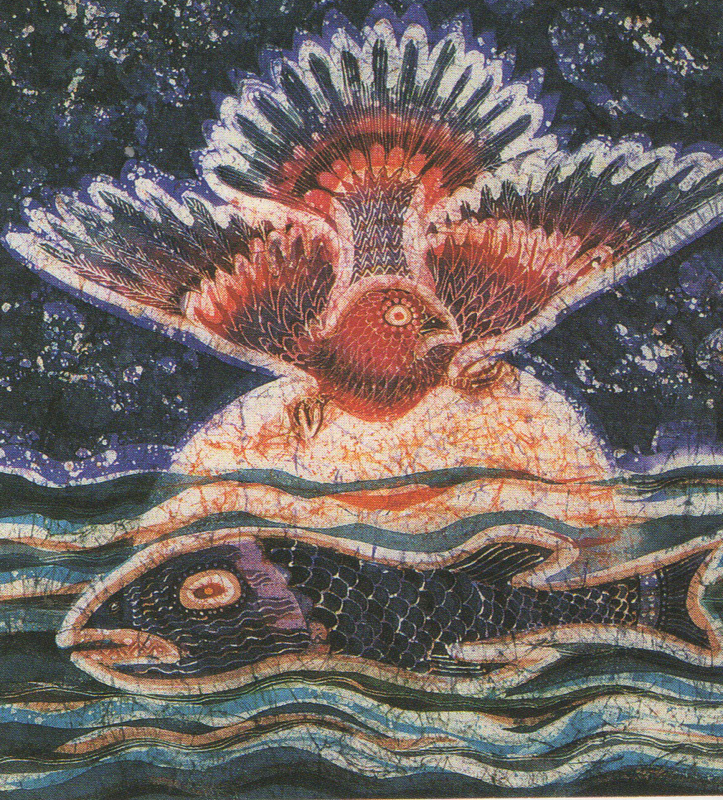 The song of the Nightingale and the Turtle Dove began to give the other birds courage. IF POSSIBLE FILL THE STAGE WITH MIST. to fill the valley with fog. The fog has the the smell of stagnant water. It will make you lose your way. Your wings will become wet and heavy and make it difficult to fly. THE BIRDS DROOP THEIR WINGS. The Monster will confuse you with soft whispering. You won't know where it comes from. WE HEAR THE RECORDED VOICE OF THE MONSTER OF DOUBT OR THE ACTOR PLAYING THE MONSTER WHISPERING OFF-STAGE. HIS VOICE IS MAGNIFIED. THE BIRDS REACT IN FEAR. WHERE THEY WONDER IS THE VOICE COMING FROM? You are not good enough to find the treasure. 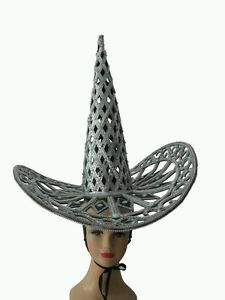 You are not clever enough to break my spell. You are not strong enough to reach the garden. You will not survive this journey. THE BIRDS ARE CONFUSED AND TERRIFIED. Do not listen to these whispers. 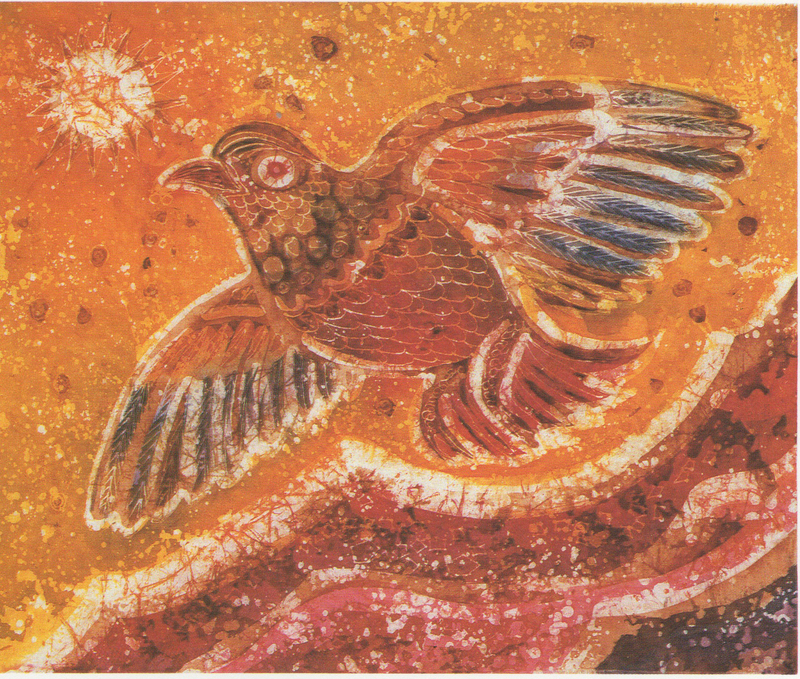 Remember the clear music of the Nightingale and the gentle song of the Turtle-dove. PERHAPS WE HEAR THE NIGHTINGALE AND THE TURTLE DOVE AGAIN. Trust yourselves, for that is the magic that will break the spell of the Monster of Doubt. Remember the Golden Feather, shining like a star in your hearts. The Golden Feather will protect you through the dangers of the seven valleys. The birds heard the Monster of Doubt again. You will not survive the journey. But the birds remembered the Hoopoe's words and defied the monster. You cannot fill me with the fog of doubt. I will not listen to your words. I am strong enough to reach the Great Being. I will overcome the power of your spell. THESE SIX BIRDS AND SOME OTHERS FOLLOW THE HOOPOE FLYING OFF THE STAGE. 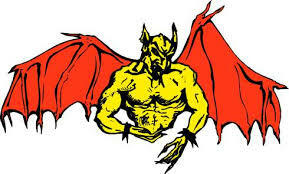 Their heavy wet wings grew lighter and they knew they had broken the spell of the Monster of Doubt. They followed the Hoopoe to the next valley. OTHER BIRDS STAGGER BACKWARDS OFF THE OTHER SIDE OF THE STAGE. 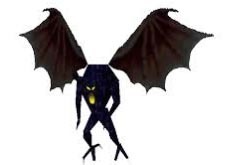 But others could not tell the difference between their own voices and the voice of the Monster and their wings grew heavy. IF THERE HAS BEEN A MIST IT LIFTS. MORE BIRDS ENTER THE STAGE. The birds that remained flew on into the second valley, the valley of False Dreams. IF POSSIBLE INTRODUCE A PINK MIST ONTO THE STAGE. THE BIRDS CANNOT SEE THEIR WAY. The air was thick and sweet and suffocating. They could not see their way. Then they heard the voice of the Monster of False Dreams, speaking from inside the mountain. 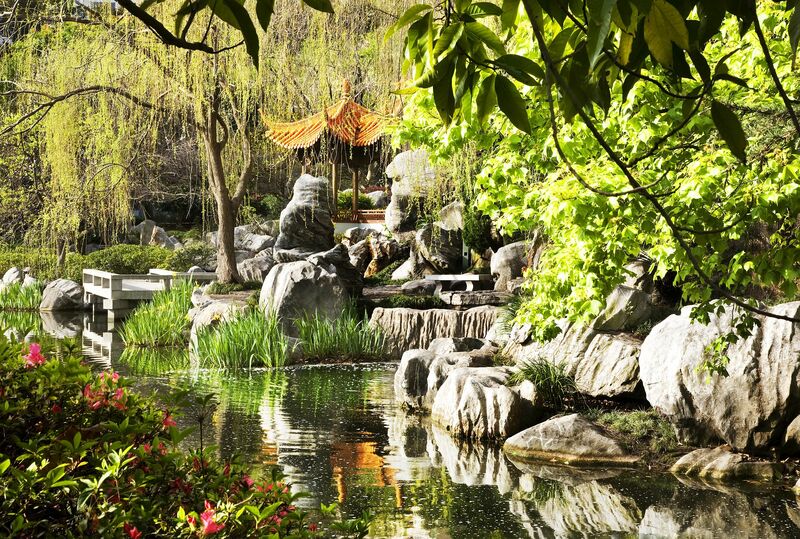 Follow me and I will show you a quicker, easier way to the garden of the Great Being. Follow me and I will give you a special drink that will make you brave and strong. Come my way and I will give you dreams that will make you forget your fear and loneliness. Do not listen to this voice, or you will fall into a deep sleep. Do not drink what the monster offers you or you will forget who you are and your life will be lost. 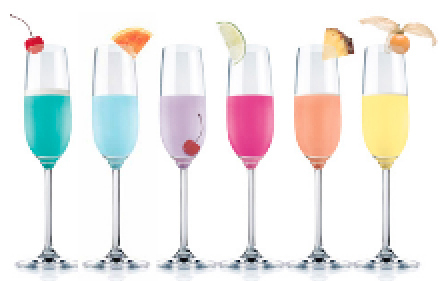 HANDS AND TALONS APPEAR EACH SIDE OF THE STAGE, OFFERING GLASSES OF COLOURED DRINKS. THE HERON TAKES A SIP OF ONE OF THEM. HE STAGGERS SLEEPILY ABOUT THE STAGE. HE DROPS HIS DRINK. THEN HE SEES THAT OTHER BIRDS ARE SIPPING THE DRINKS. HE MAKES AN EFFORT TO BE STRONG AND TEARS THE DRINKS AWAY FROM THEM. NARRATOR 2: We do not want your false dreams. We will not stay in your valley. We love Mother Earth and want to help her. We love and trust each other. We will not forget who we are. THE CORMORANT, ALBATROSS AND PEACOCK FOLLOW THE HERON AND THE HOOPOE ONE WAY OFF THE STAGE. They broke the spell of the monster and flew out of the valley. OTHER BIRDS DRINKING THEIR DRINKS STAGGER BACKWARDS THE OTHER WAY OFF THE STAGE. But some birds drank too much of the drug that tasted so sweet. They forgot who they were and fell asleep in the Valley of False Dreams. And they were left behind. THE HUMMING BIRD, THE EAGLE, THE OWL, THE PEACOCK, THE NIGHTINGALE AND THE HAWK APPEAR. Then the birds flew on into the Valley of Envy, where there was a green mist. At once they felt the powerful spell of the monster of the valley. Each bird longed to be like some other bird. The Humming-bird wanted to be like the Eagle. THE HUMMING BIRD AND THE EAGLE COME FORWARD. THE EAGLE LOOKS VERY PROUD. THE HUMMING BIRD LOOKS UP AT HIM. HAWK: I want to be strong like you. THE HUMMING-BIRDS WALKS SADLY AWAY. THE OWL COMES FORWARD. THE EAGLE PEERS AT HIM. I want to be clever like you. THE EAGLE WALKS SADLY AWAY. THE PEACOCK COMES FORWARD. I want to be beautiful like you. THE OWL WALKS SADLY AWAY. THE NIGHTINGALE COME FORWARD. I want to sing like you. Ha. ha. You can only squawk. THE PEACOCK LOWERS HIS FEATHERS AND WALKS AWAY. THE HAWK COMES FORWARD. I want to be powerful like you. Really!? I want to be more powerful than all the other birds together. THEY GO BACK AND JOIN ALL THE OTHER BIRDS. THEN A NET IS THROWN FROM OFF STAGE TO COVER ALL THE BIRDS. THERE IS A WHOOSHING NOISE. THEY STRUGGLE TO GET OUT. NARRATOR 1: (LAUGHING FROM OFF-STAGE) You are too helpless and weak to break my spell. You will not free yourselves from the net of envy. It is as strong as iron. THE BIRDS STRUGGLE IN VAIN TO FREE THEMSELVES. If only I could be like the condor. If only I were stronger I could free myself. (APPROACHING FROM THE SIDE OF THE STAGE) Remember the Golden Feather in your hearts. It's as delicate as a spider's web, that links you to the Great Being. Let go of your wish to be someone else. Be true to yourselves; and the net of envy will dissolve. THE HUMMING BIRD AND THE WREN MANAGE TO CUT A HOLE AND ONE BY ONE THE OTHER BIRDS CLIMB THROUGH. The tiniest and weakest of birds, the Humming-bird and the Wren find a way to cut the net; so that others can climb free. THEY FLY AWAY AFTER THE HOOPOE. But some birds damaged their wings and were unable to fly. BUT SOME HAVE HURT THEIR WINGS. THEY BACK AWAY THE OTHER SIDE OF THE STAGE, DRAGGING THE NET AFTER THEM. And stayed in the valley. SOME STAGE HANDS (PROBABLY BIRDS WHO HAVE TAKEN OFF THEIR COSTUMES) BRING ON A BACKDROP OF VOLCANOES BELCHING FIRE AND SMOKE. NOISE OF FIRE AND EXPLOSIONS. 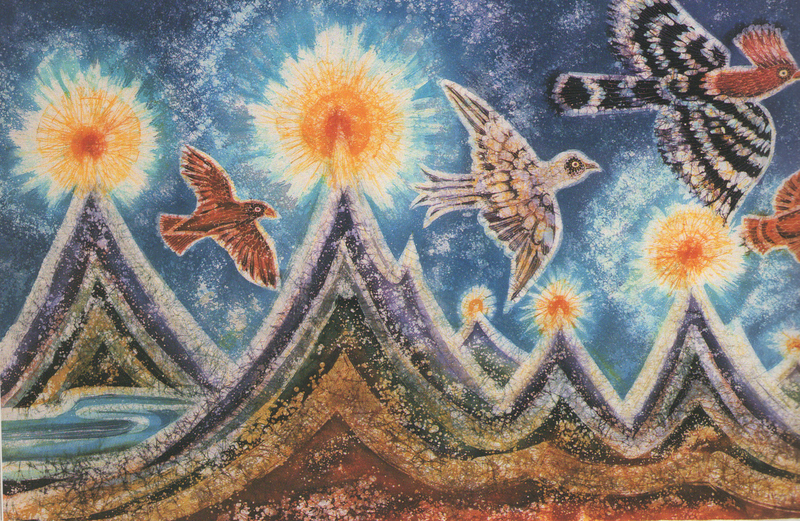 NARRATOR 2: THE HOOPOE AND THE FREE BIRDS FLY ONTO THE STAGE. The free birds flew on to the fourth valley, the valley of Hate. From far away they saw a volcano belching forth fire. 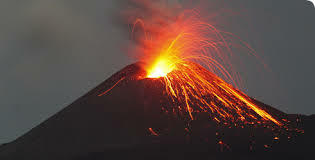 Flaming rivers of lava flowed down the mountain burning everything. NARRATOR 2: No one can stand against me. Where hate rules, nothing lives. Your way lies through me and you will be burnt to cinders as you fly. 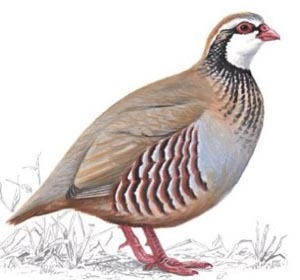 THE PARTRIDGE FLIES AHEAD OF THE OTHER BIRDS. But the birds, who were now led by the partridge, trusted the Hoopoe and held to their course. Be brave. Follow me. Ouch! SHE PRETENDS TO BEAT OUT SPARKS AND THE OTHERS COPY HER. Although the partridge had suffered terribly in the wars on Earth, she did not surrender to the spell of hate. But our feathers are burnt. If you have survived at all, you have broken the spell of the Monster of Hate. You are amazingly strong and brave to have come through this valley. Many blessings will come your way. SOME BIRDS HOWEVER ARE LYING DOWN DEAD. THE SURVIVORS WEEP OVER THEM. But some birds lay dead on the floor of the valley. The remaining birds wept with sorrow for their friends, who had died in the flames of Hate. They wished they could bring them back to life. THE DEAD BIRDS GET UP AND RETURN THE WAY THEY CAME. The spirits of the dead returned to the Earth they had come from. THE STAGE HANDS REMOVE THE BACKDROP OF THE VOLCANO REVEALING THE ORIGINAL BACKDROP. BUT THIS BACKDROP CAN BE COVERED WITH GAUZE TO MAKE IT LOOK COLOURLESS. THE REMAINING BIRDS FLY ON. I must warn you. To overcome the Monster of Greed and Power of the fifth valley, you must be stronger than steel. THE FAIRY BLUEBIRD FLIES PAST THE HOOPOE, MAKING HER CALL. 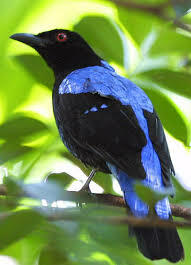 Yet more gentle than the Fairy Bluebird. In this valley, nothing green nor living was seen. THE BIRDS START GASPING FOR BREATH. The air was so dry and thin that the birds gasped for breath. Fear, like an invisible, iron hand, clutched at their throats. NARRATOR 2: OFF STAGE THE MONSTER OF GREED AND POWER GIVES A GREAT ROAR. I control everything. I know the truth about everything. I am always right. THE BIRDS ALL STOP MOVING. If you stay in my valley, I will give you all the power, all the control, all the things, all the knowledge you want, so others will have to obey you. They began to feel paralysed by the black, invisible rays of the Monster of Greed and Power. You will never again be weak, helpless, ignorant birds. You will never again need to suffer. You will have everything you want. You will be richer than other beings. THE HOOPOE FLIES BACK AND FORTH IN FRONT OF THE PARALYSED BIRDS. Wake up! Wake up before it is too late and you have lost your heart for ever. The Monster of Greed and Power is very clever, like the Monster of False Dreams. He will persuade you stay in this valley and forget your quest for the Great Being of the world invisible. THE TINY CHINESE TREE SPARROW WAKES UP AND TURNS TO THE OTHERS. The first to wake up was the tiny Chinese, tree Sparrow. ONE BY ONE AS SHE SPEAKS THE OTHER BIRDS BEGIN TO MOVE AND TO WAKE UP. Rid yourself of greed with generosity. Learn to say thank you for your life. This will help to remove greed and the longing for power. THE BIRDS BEGIN TO MOVE AND FLAP THEIR WINGS. (MANY CHORUS TOGETHER) Thank you! Thank you! Thank you! But other birds could not resist the black rays of the monster. They were turned to stone and could not fly out of the valley. THOSE WHO REMAIN PARALYSED ARE DRAGGED OFF THE STAGE BY STAGE HANDS OR OTHER BIRDS. STAGE HANDS REMOVE THE GAUZE OVER THE BACKDROP. THOSE BIRDS WHO CAN MOVE CONTINUE THEIR FLIGHT. 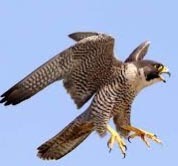 HAWK: The birds who were left approached the sixth valley, the Valley of Cruelty. The spell of the monster who rules this valley is very strong and hard to see. You will have to find the courage to face your own cruelty. That will not be difficult. I am very brave. 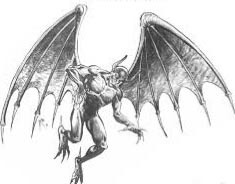 SUDDENLY LOTS OF WINGED DEMONS FLY FORWARD TO ATTACK THE BIRDS WITH CRUEL TALONS AND STINGS AS SHARP AS NEEDLES. OWL: As the birds flew into the Valley of Cruelty winged creatures screamed out of caves in the mountains to attack them. 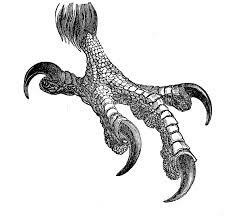 They had cruel talons and stings as sharp as needles. It's all right to be cruel. It's fun to be cruel. It's brave to be cruel. Suddenly the Hawk realised these were ghosts of birds he had killed in battle. He was face to face with his own cruelty, which he had never seen before. Hot tears streamed from his eyes. Because he was brave he called out to the Monster of the valley. I will not fight any more. Call off your creatures of death! Release them from your spell! Let me be friends with my former enemies. Killing only brings more death. Do you think one hawk can break the spell of ten thousand years? What is your feeble will against mine? Do you think these demon birds will stop fighting because you invite them to be friends? You may be brave, but you are a fool. I am now a warrior on behalf of life. I call upon the holy name of the Great Being, and the names of all the birds of the Earth, to stand up with me for life against death. ALL THE BIRDS GIVE A GREAT SHOUT. THERE IS AN EXPLOSION. 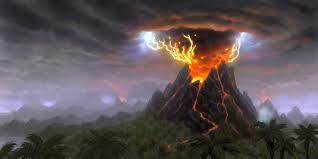 The great shout of the birds shattered the mountain where the Monster of Cruelty lived. And the terrible spell of Cruelty was broken for ever. SEVERAL BIRDS ARE LYING ON THE GROUND. THE PHEASANT LOOKS OUT AT THEM AND THEN AT THE AUDIENCE. From the mountain pass above the valley the Pheasant looked back on the dead. HE LOOKS UP ABOVE THE AUDIENCE. He knew that love he felt for his friends lost in battle would one day bring them back to life. Then the few birds who had survived flew on; on into the darkness of the seventh and last valley, the Valley of Despair. A BLACK DRAPE IS DRAWN ACROSS THE BACKDROP. THE STAGE BECOMES DARK. Do not fall under the spell of the monster's voice speaking in your heart. If you do, you will die from fear. IN THE DARKNESS WE HEAR THE NIGHTINGALE. A RUBY ON THE HOOPOE'S CHEST IS LIT UP BY A PIN POINT LIGHT. 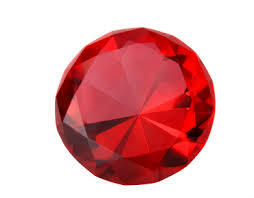 and look out for the ruby on my chest. for this monster has the deepest wound and is more terrible than all the others. THE BIRDS STUMBLE ABOUT AS IF BLIND, FEELING THEIR WAY AND BUMPING INTO EACH OTHER. The birds could see nothing. The darkness was as black as a Raven's wing. The monster's breath squeezed them like a python. It made them feel numb and cold and weak and weary. AS IF SHE IS BEING SQUEEZED. The owl felt the power of the monster seize her like the tentacles of an octopus, pulling her into freezing cold, inky black darkness. 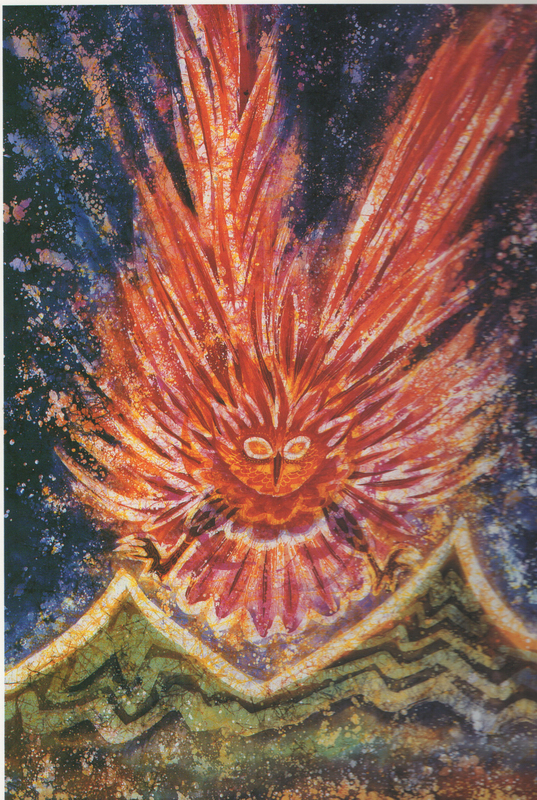 But she was stronger now that she and the other birds had broken the spell of the other six monsters. She did not forget the Hoopoe's words and listened carefully to the evil voice in her heart. You have failed the quest; your journey is useless. There is no point to anything. You will never leave this valley, for there is nothing beyond it. There is no Great Being over the edge of time. There is no message to bring back to the Earth. You will disappear into the darkness for ever. NARRATOR 1: The monster's voice made the owl feel sick with horror. 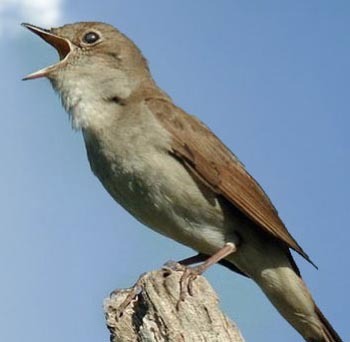 WE HEAR THE SONG OF THE NIGHTINGALE. But then she heard the voice of the Nightingale ring out, clear and true. I sing of joy and light and colour and beauty. I sing of the bliss of following the way of the heart through seven valleys. I sing to help you defeat the spell of the Monster of Despair. I help you to trust yourselves, to help you remember, remember, remember. And the Hoopoe cried out to all the birds. Come on! Remember the Earth for whose sake you have travelled so far. Close your eyes and you will see a beam of white light, pouring into the valley from the garden of the Great Being. Follow this light and you will break the spell of the last monster. THE PIN POINT LIGHT PICKS OUT THE RUBY ON HER BREAST. As she spoke the ruby on her breast glowed in the darkness. And the birds remembered Mother Earth and their love for her. They closed their eyes and saw the bright beam of light. THE OWL FIRST AND THEN ALL THE OTHER BIRDS FLY AROUND THE STAGE, WHICH GETS SLOWLY LIGHTER. NARRATOR 1: Led by the owl, they began to fly along it. As they flew they sang a song. COMPOSE AND PERFORM YOUR OWN MUSIC OR LOOK AT THE YOUTUBE AND FOLLOW THIS TUNE. THE WORDS HAVE BEEN CHANGED SLIGHTLY, BUT THE BIRDS CAN SING THE FOLLOWING: IF IT IS POSSIBLE TO PROJECT THE WORDS ONTO A SCREEN BESIDE OR ABOVE THE STAGE THEN THE AUDIENCE COULD JOIN IN. This our song of grateful praise. And because the birds had healed the Monster, none of them stayed behind in the valley of Despair. And the shore of the great sea that is unlike all other seas. STAGE HANDS BRING ON AND HOLD UP LONG STRIPS OF BLUE, SILVER AND GREEN MATERIAL AND WAVE THEM TO LOOK LIKE THE SEA. 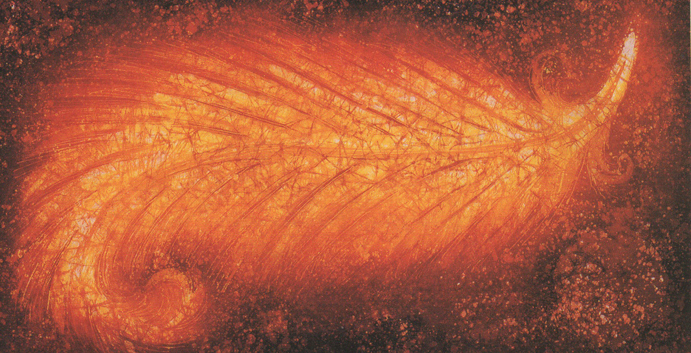 THE BIRDS TAKE DEEP BREATHS AND DIVE IN BETWEEN THE STRIPS OF MATERIAL. Holding their breath the birds dived into the depths of those silvery waters. Which reminded them of their dreams. The sea was neither as light as air, nor as heavy as water. THE STRIPS OF MATERIAL ARE WITHDRAWN TO REVEAL A NEW BACKDROP OF A BEAUTIFUL GARDEN. BE INSPIRED BY THESE PICTURES TO CREATE BACKDROPS. 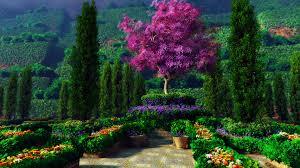 Just as they felt they had reached the end of their strength, they saw the garden. Shining at the bottom of the sea. THE BIRDS ARE EXHAUSTED. THEY CAN HARDLY LIFT THEIR HEADS. The few who had completed the journey were exhausted and scarred with burns and cuts. They hardly had the strength to lift their heads. SLOWLY THEY LIFT THEIR HEADS. The Nightingale was the first to do so. 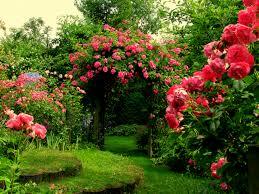 Look at the beautiful roses - my favourite flower. THE OTHER BIRDS LOOK AROUND THEM. 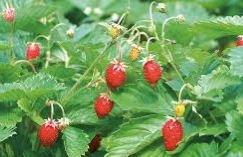 The ground was soft with warm green moss and covered with wild strawberries. Waterfalls sparkled and everywhere they heard the buzzing of bees. In the middle of the garden was a small hill and they saw a flight of steps leading up it to the House of the Treasure. The house was lit up as if the walls were transparent. A great light was shining inside it. A BACKDROP OF THE HOUSE OF TREASURE IS DRAWN BY STAGE HANDS ACROSS THE BACK OF THE STAGE. IT HAS A DOOR WHICH OPENS. A TALL, MAJESTIC FIGURE APPEARS. SHE OR HE HAS A HAT, AS IN THIS PICTURE, BUT IT IS COVERED WITH STARS AND SO IS HER/HIS ROBE. The Keeper of the Door appeared. Where have you come from, Birds? You, who have left everything behind to follow the quest through the darkness of the seven valleys, where is your home? What do you want and what can I do for you? THE EXHAUSTED BIRDS FLUTTER A LITTLE. Our guide, the Hoopoe, led us here. It has taken us a lifetime to reach the garden. We have come to bring a message from the Earth to the Great Being who is the life of all life. Mother Earth is very sad and she has sent us to ask for help. If we are not allowed through the door, what is there left for us to do? We cannot return to Mother Earth without bringing her the message from the Great Being. THE KEEPER STRETCHES OUT HIS HAND AS IF SHE OR HE IS FEELING THEM. I have tested your hearts and find them true. THE STAGE LIGHTS UP AS MUCH AS POSSIBLE. STAGE HANDS BRING ON A BACKDROP OF THE COSMOS.WE HEAR BEAUTIFUL MUSIC. IT MIGHT BE COMPOSED AND PERFORMED BY THE TEACHERS, STUDENTS OR FAMILIES AND FRIENDS OF THE STUDENTS. IT MIGHT BE BEAUTIFUL CHINESE OR INDIAN MUSIC. IT MIGHT BE ÒSONG OF THE ANGELÓ BY JOHN TAVENER. IT MIGHT BE WESTERN CLASSICAL MUSIC, SUCH AS BACH, MOZART, BEETHOVEN OR TCHAIKOVSKY. FOR THE FIRST TIME THE STAGE IS EMPTY AND WE LISTEN TO THE NARRATORS. The birds went through the door into the House of Treasure and entered the Heart of the Great Being. It was as if they entered a room of a thousand dazzling mirrors, each one reflecting a light so brilliant that they were blinded. 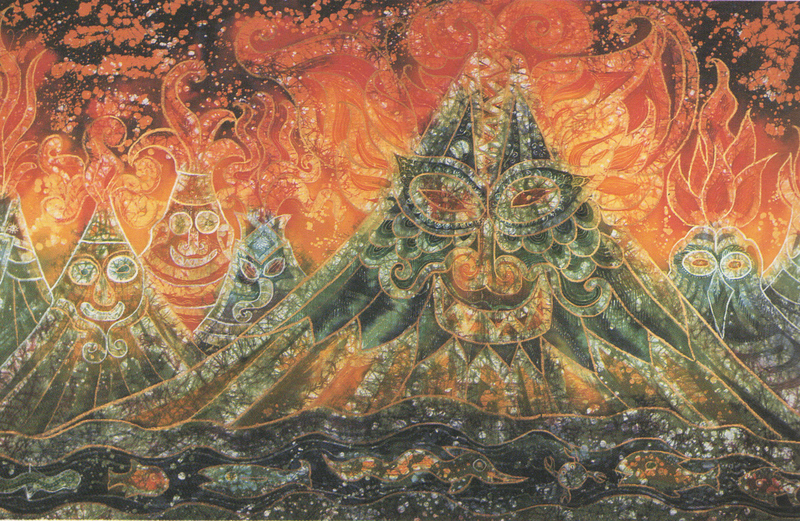 As their eyes grew used to the light, they saw that it streamed into all forms of life. GREAT BEING: Then they knew they were in the heart of the Great Being. Each of them knew they were, at one and the same time, themselves and each other. They were at once the Great Being and every single, tiny part of that life. 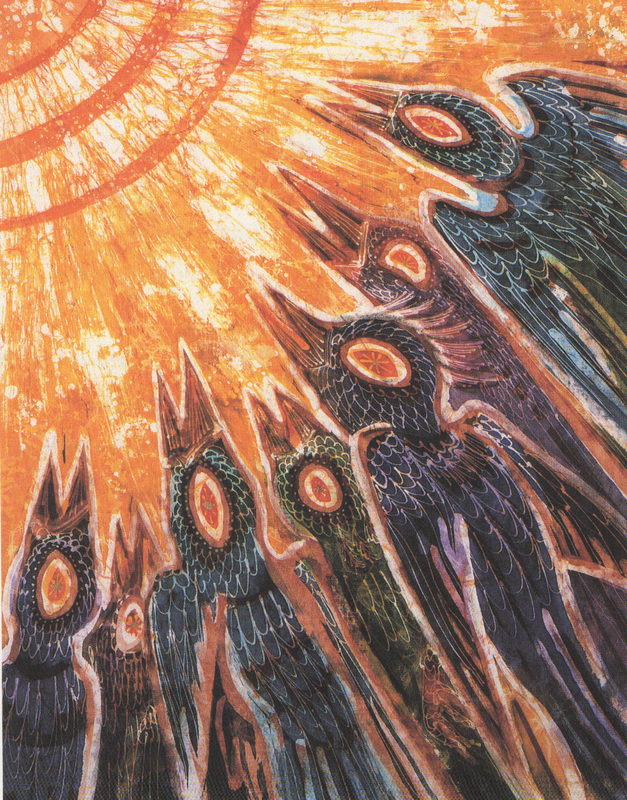 They saw thousands of dancing suns. Millions of stars and moons. Then the Great Being spoke to them. A GOLDEN FEATHER IS BROUGHT BEFORE THE DOOR. WE SENSE THE PRESENCE OF THE GREAT BEING SPEAKING FROM THE COSMOS. In the beginning when I brought everything into being, I gave to the Earth a golden feather, as delicate as a spider's web, silken as a butterfly's wing, radiant as a star. I knew that after millions of years that feather would bring you to me in the world invisible, to my garden in the depths of the sea. You listened to Mother Earth. You followed the Hoopoe, beyond the edge of time to find me at the heart of life. THE HOOPOE EMERGES FROM THE DOOR. Great Being, will you give us a message to take back to the Earth? You yourselves, as you now are, you are the message. THE GREAT CRESTED CRANE EMERGES FROM THE DOOR. You have broken the spell of the monsters of the seven valleys. THE HUMMING BIRD EMERGES FROM THE DOOR. You have seen the vision of the Treasure. THE PARROT EMERGES FROM THE DOOR. You are no longer helpless, weak, ignorant birds. THE ARCTIC TERN EMERGES FROM THE DOOR. 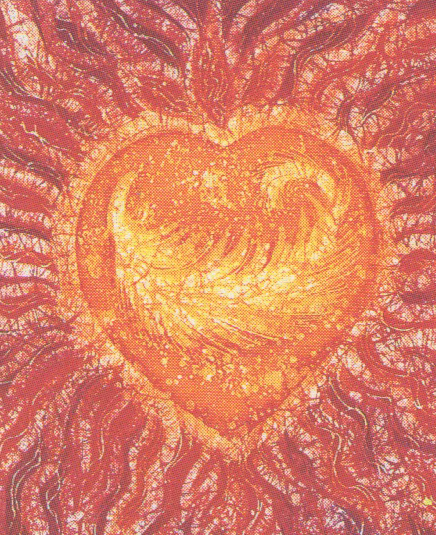 Now you know your true nature, the divine heart of your being. THE SWALLOW EMERGES FROM THE DOOR. You know that I am the heart of each one of you and you are within my heart for ever. THE DOVE EMERGES FROM THE DOOR. You can return to Mother Earth knowing that every atom, every stone, every leaf, every tree of Earth is lit by the secret, blazing light that streams from me. THE PEACOCK EMERGES FROM THE DOOR. Wherever you are, you have only to imagine me and I will be with you. THE HERON EMERGES FROM THE DOOR. If ever you are anxious, I will give you strength and wisdom. THE PARTRIDGE EMERGES FROM THE DOOR. If ever you are afraid, you have only to imagine my light and you will have courage. THE DUCK EMERGES FROM THE DOOR. You have flown beyond the edge of time, so you know there is no death, but only one eternal life. THE CONDOR EMERGES FROM THE DOOR. Tell the children of the Earth what you have seen, so they will not fear death. THE KINGFISHER EMERGES FROM THE DOOR. Go now, my beloved birds, and tell your story to Mother Earth. THE BIRDS FLY ABOUT THE STAGE. IF THEY HAVE MANAGED TO ADD MORE COLOURFUL PLUMAGE (FEATHERS) TO THEIR COSTUMES THAT WILL BE GOOD. THE PRESENCE BEHIND THE DOOR AND THE GOLDEN FEATHER FADE AWAY. 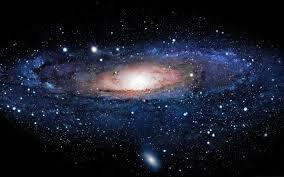 THE BACKDROP OF THE COSMOS IS DRAWN AWAY. The Golden feather was now in the birds' hearts. The journey that had taken so long before now flashed by in a few seconds. 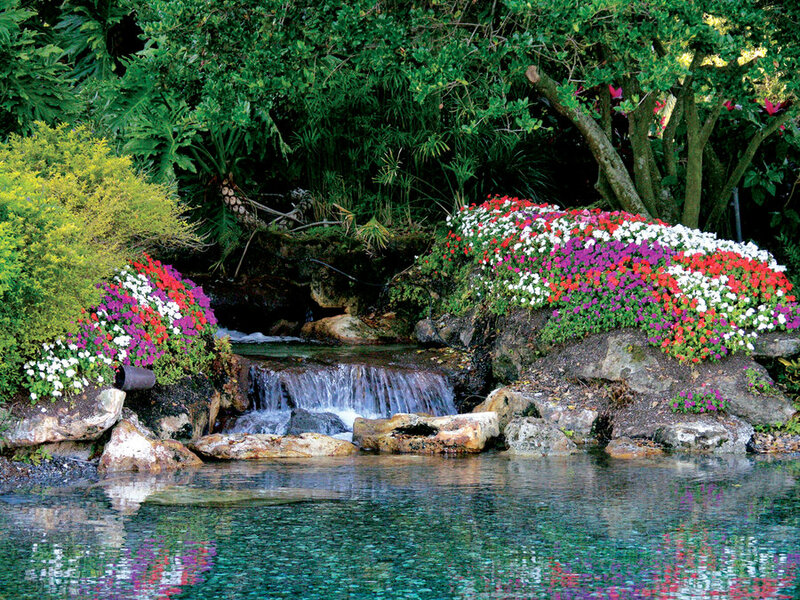 They saw that each of the valleys became as beautiful and richly alive as the garden. All the birds who had fallen under the spell of the monsters came alive again and flew with their friends towards Mother Earth. And back to their meeting place. 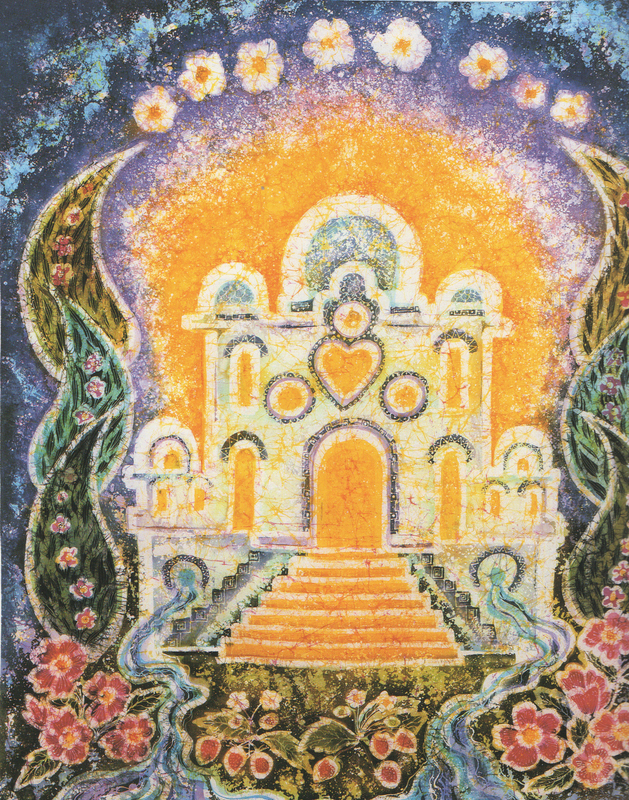 THE HOUSE OF TREASURE IS REMOVED TO REVEAL THE ORIGINAL BACKDROP FROM THE BEGINNING OF THE PLAY, THOUGH NOW THERE SHOULD BE MANY MORE FLOWERS. Together they saw the jewel-like beauty of their home coming closer. MOTHER EARTH AND THE BOY AND GIRL ENTER ONE SIDE OF THE STAGE. Look here are the birds again. And the land is more beautiful than before. THE BIRDS LAND AND GESTICULATE TO MOTHER EARTH. Quietly the birds told their story to Mother Earth and to the children. Dear Birds, you have saved my life. How can I thank you for all you have done for me and for all my children? SHE SMILES DOWN AT THE CHILDREN.AND THEN OUT TO THE AUDIENCE. You can tell your story to my children. They will love and protect me for my sake and the sake of their children and their children's children. THEN MOTHER EARTH LOOKS OUT TO THE AUDIENCE. They will not fall under the spell of the seven monsters. One day each of them will make the journey to the garden in the depths of the sea. SHE LOOKS BACK AT THE BIRDS. And you, dear birds, will be as the Hoopoe, the messengers of the world invisible. You will lead the children to the House of the Treasure and the Great Being, who is the life of all life. IF POSSIBLE, HERE THE GOLDEN FEATHER WILL BE LOWERED ONTO THE STAGE. And the Golden Feather will shine for ever in your hearts. STARTING WITH THE HOOPOE, THE BIRDS MAKE THEIR CALLS, AND ONE BY ONE THEY CURTSEY OR BOW TO THE AUDIENCE. THEN THEY ALL DO SO TOGETHER. If there are too many speaking parts they can be reduced to 28 by doubling the Boy and the Peacock, the Girl and the Partridge, Mother Earth and the Duck, the Great Being and the Heron, the Keeper and the Sparrow, Doubt and the Thrush, False Dreams and the Falcon, Envy and the Condor, Hate and the Raven, Greed and the Nightingale, Cruelty and the Swallow, Despair and the Flamingo. They can be reduced by a further 3 to 25 parts by making the Wren and the Humming Bird into one bird, the Albatross and the Parrot into one bird, the Crane and the Hawk into one bird.